I was so tickled to have had a White-winged Dove hang around for weeks; it would be the first such bird on the 20 year old Spanish Peaks CBC! I promised the folks they could come by and add it to their counts...most hadn't seen one yet. Of course it was nearly a no-show! Only Dave Moore got a view of it before we entered my back-yard... it immediately flew and no one else got to see it. so diff 'rent, so much the same. It hid for the count. In addition to the white showing on the leading edge of the folded wing, the blue around the eye and the dark facial mark, this bird also lacks a collar, so familiar on the Eurasian dove. Photo from Wikipedia - click to see unusual blue surounding eye! 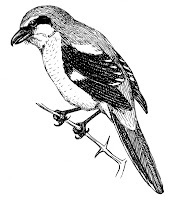 Sometime ago, I wrote about Shrike: The Butcher Bird, mostly writing about the Loggerhead variety. I am absolutely fascinated by these tiny predator-birds and would enjoy watching them hunt. I've watched hawks hunt my feeders and once or twice got to actually see them successful. 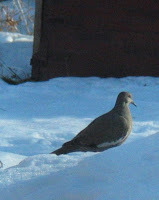 I give the little birds I feed a fair chance by keeping feeders in places not too far from bushes and small trees. Past that, I figure what happens is a natural selection process...a culling of bad genes and the feeding of healthy ones. The Latin species name of the Northern Shrike, Lanius excubitor, means "Butcher watchman," which fits, as the bird hunts from a perch and flying down behind prey, sometimes chasing it as shown in the first video clip below. It seizes its prey with its study bill and uses the hook, biting vertebrates through the neck to sever the spinal cord. The bird removes wings, spines, and stingers from insects. Generally it impales prey, sometimes while prey is still alive, on thorns, spines, or barbed wire, because while this is a predator bird, its feet are not strong enough for holding and tearing flesh. Occasionally it will wedge a meal in the crook of two twigs and pull the flesh apart that way. Prey may be consumed it right away or left for later consumption. Young Northern Shrikes are brownish, while young Loggerheads are grayish. Both male and female Northern Shrikes sing throughout year. The nest of the Northern Shrike is an open cup, but it is so deep that the sitting female is almost completely out of view, save for the tip of her tail sticking out overtop. "Another visitor has been a Northern Shrike that has appeared almost every day since the end of November. He will hunt the backyard sometimes for an hour before going somewhere else. I have seen him with mice, and one late afternoon he pierced a House Sparrow on a sharp stick devouring him before the cold night set in. I have added photo gallery link [here], if interested. Every winter seems to bring some kind of surprise." Of course I wrote him off-line! I commented on the excellent photos he posted of a sweet-looking little birdie, not something that might be called a 'Butcher'! LOL So, I asked him if he had other photos and Mark kindly sent me three previously unpublished photos. I include them here. "This afternoon while snowshoeing around South Pond, one of the Blue River Ponds in Silverthorne (Summit City), I had a Northern Shrike fly by me, about 8'-10' off the ground chasing a small passerine. It was surprising as I normally see shrikes perched on tree branch tips or wires with an occasional foray at something on the ground. This was like a WW I plane chase. After ~100 yds of darting and diving, I lost sight of the two birds so don't know who "won". Nice experience." Charlie Nims of Silverthorne did have a nice experience...and it dovetailed nicely into the photos from Mark. I plan to send a link to this post to Charlie so he can see what, hopefully for the hunter, may have been the outcome he missed. Thanks to both gentlemen, for sharing these incredible stories and pictures! Don't forget to click Mark's photos here...for a better view of his wonderful photography. Here is an interesting clip from YouTube of a hunting shrike...catching and dispatching a mouse. There is also a rather gruesome shot of his dinner, saved for later. And another very short clip which shows a shrike eating, and how it is that securing its food before it eats works for the little guy. The bird is, of course, here this morning. Photos from Wikipedia except where noted from Randy Hancock. Thanks Randy! Today, I'd say this is a Cooper's Hawk, based on several things. One, the tail has a white edge and a 'rounded' appearance rather than sort of straight across the edge, like a Sharp-shinned would have. Also, while this bird is obviously young (as evidenced by the white blotching on the back and the white line above the yellow eye), it has a lighter nape; giving it a 'capped' look. The Sharpie has a more 'hooded' look and a darker back-of-the-head and without that line where the darker coloring of the back begins below the nape...like this Cooper's has. All this intersts me because I saw another hawk in my yard the other day. At fast glance, it was the spitting image of the bird above (I didn't get a picture), however...this was the smallest hawk I'd ever seen. Truely, it wasn't any bigger than an American Robin! Such a small raptor! 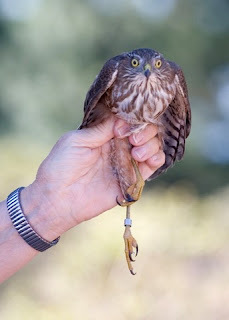 I found a photograph showing just how small the Sharp-shinned Hawk can be! This photo is by Adam Paul, who's blog includes a story about the bird. Click his name! So, the bird is leaning forward instead of up tall...but still; like a robin, I tell ya. 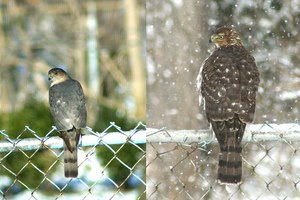 Okay, since female hawks are larger; a female Sharpie can be about the same size as a male Cooper's Hawk...so you do need to learn more about how to tell these birds apart. Here is a really, really good link to Cornell's Project Feeder Watch page about Tricky IDs, these two birds specifically. There is some awesome information there, as well as several photographs, including one by my blogging-buddy Seth Reams. Okay, I've never met Seth or his lady Michelle, but I'm an avid follower of their blog: Portland Oregon Backyard Birds; we exchange thoughts now and then...I consider 'em both pals! What a treat to find his photograph on Cornell! Again, if you're having trouble (and who hasn't) with these two birds, check out that Cornell page; or this one on distinguishing the younger and adult Accipiters; it's excellent. The Lewis's Woodpecker, Melanerpes lewis, is a medium-sized bird named for Meriwether Lewis, one of the explorers who surveyed, mapped and explored the areas bought by the United States of America during the Louisiana Purchase. "The Black woodpecker which I have frequently mentioned and which is found in most parts of the roky Mountains as well as the Western and S. W. Mountains, I had never an opportunity of examining untill a few days since when we killed and preserved several of them. This bird is about the size of the lark woodpecker or the turtle dove, tho' it's wings are longer than either of those birds. The beak is black, one inch long, reather wide at the base, somewhat curved, and sharply pointed; the chaps are of equal length. Around the base of the beak including the eye and a small part of the throat is of a fine crimson red. The neck and as low as the croop in front is of an iron grey. The belly and breast is a curious mixture of white and blood red which has much the appearance of having been artificially painted or stained of that colour. The red reather predominates. The top of the head back, sides, upper surface of the wings and tail are black, with a glossey tint of green in a certain exposure to the light. The under side of the wings and tail are of a sooty black. It has ten feathers in the tail, sharply pointed, and those in the centre reather longest, being 2-1/2 inches in length. The tongue is barbed, pointed, and of an elastic cartelaginous substance. The eye is moderately large, puple black and iris of a dark yellowish brown. Meriwether Lewis also mentioned that his woodpecker “flys a good deal like the jay bird.” After more observations of flight and vocalization, the bird reminded him of the Red-headed Woodpecker of Virginia. 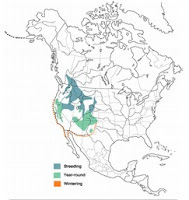 Lewis's Woodpecker: Breeds from southern British Columbia and Alberta south to central California, northern Arizona, and northern New Mexico. It spends winters from southern British Columbia and Oregon to Colorado and south to northern Mexico. Open pine-oak woodlands, oak, or cottonwood groves in grasslands, and ponderosa pine country are preferred habitats, especially for breeding. Lewis’s Woodpecker is a uniquely dark-colored woodpecker with long wings and tail. Its slow wing-beat-and-glide, while chasing flying insects, results in a complex flight pattern. Lewis's is a common woodpecker of mountain ranch lands; some ranchers call it the "Crow Woodpecker" because of its dark color, large size and slow flight. This is one of the largest American Woodpeckers, with blackish-green upperparts, a prominent silvery-gray collar and upper breast, dark red face with pinkish or salmon-red lower breast and belly. Though males are slightly larger, individuals cannot be sexed reliably without examination in the hand. Juvenile lacks red face and collar, and has less red on belly. The bird is generally silent in flight. It’s a shame that, before the field guides by Roger Tory Peterson…the only way to ‘discover’ a bird was to shoot and then handle it. As a matter of fact, our current Christmas Bird Count has its roots in the Christmas Day practice of contests involving who could shoot the greatest number of birds! As a matter of fact, even the concept of The Big Year, a year-long bird count, has it’s roots in Audubon’s great birding adventure where his quest was to paint a life-size portrait of every bird in the New World. Unfortunately, to paint a bird required heavy sacrifice; to complete a single drawing, Audubon had to shoot and kill whole flocks of birds just to select the one or two birds with the best plumage. He then treaded wire into the carcasses and posed them as if they were still alive and painted watercolors that were big, bold and remarkably animated. While he was a sharpshooter and hunter, Audubon abhorred the thought of the total destruction of a species. He warned about killing only because one could ...like buffalo and the great auk; creatures which were on the verge of disappearing forever. When Audubon died, a student of his wife’s, also aghast at senseless wildlife killings, created the first bird preservation group and named it in honor of Mr. Audubon. Eventually that practice of shooting birds on Christmas Day came to an end and counting, instead, became the Annual Contest. 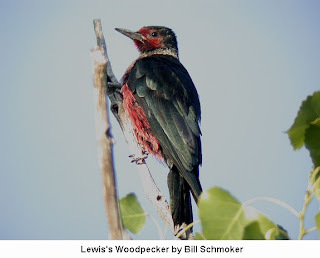 Lewis's Woodpecker has a close association with open-canopy forests like Ponderosa pine, riparian woodlands dominated by cottonwood, and burned pine forests, which has made it susceptible to habitat loss and degradation. We seldom, any more, allow forest fires. As a result, the species may have experienced up to a 60% population reduction since the 1960's. This woodpecker can be particularly aggressive in defending winter stores of acorns and other nuts. Territoriality can be intra- and inter-specific, and can occur in summer in defense of area in vicinity of nest cavity as well as in late fall and winter in defense of acorn or nut stores. While they generally appear to dominate interaction with the European Starling, the population of Lewis's Woodpeckers has been reduced by the arrival of starlings, which compete for nest sites. They were formerly fairly common in western areas, in burned forests and in open prairies with scattered trees, but with development and fire suppression, along with the invasion of starlings, they have been extirpated as a breeding species from some areas. With little data, still...all reported predators are birds...with successful predation especially by the Red-tailed Hawk. American Kestrels are reported to prey heavily on juveniles soon after young leave the nest; sometimes taking as many as half of a brood, as fledglings climbed up the nest tree for the first time. 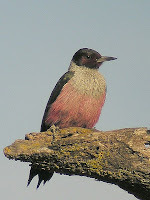 As stated, this is a large unusual-looking woodpecker with dark iridescent greenish-black back, wings and tail with rather pink undersides and a gray upper breast and collar with a red face-patch rimmed in black which covers the head like a hood. The wings are much broader than those of other woodpeckers, and it flies at a much more sluggish pace with slow, but even flaps similar to those of a crow. 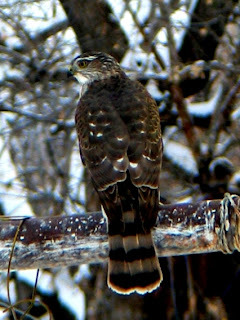 Juveniles, up to several months from fledgling, also have dark iridecent upper parts, but are mottled brown beneath with dark-brown heads and without the gray collar or red face. Head, back, wings and tail greenish-black. Belly pinkish or salmon red. Wings and tail all dark greenish-black, without white spots or patches. Lewis’s Woodpeckers prefer open forests of pine or cottonwood, west of the Great Plains, with brushy under stories, ground cover and snags. Ponderosa forests are preferred at higher elevations, with riparian woodlands dominated by cottonwoods in lower elevations. This bird especially enjoys burned pine forests where it appears more productive for the woodpeckers. Winter sites are usually oak forests or commercial orchards. Like all other woodpeckers, it requires snags (standing, dead or partly dead trees) for nesting, although it is not anatomically specialized for excavating in wood and the trees it selects for nesting are generally well decayed. Like many semi-migratory birds, within the northern portions of its breeding range, most individuals move south, but generally it is present throughout the year in many portions of its breeding range. In south-east Colorado, about half the breeding birds were resident; other half migrated to western Colorado. Migratory movements to areas outside of breeding range probably occur annually but vary considerably in magnitude from year to year. This woodpecker is opportunistic in its feeding habits, eating mostly insects in summer but switching in winter to acorns and other nuts, which it often stores in bark crevices for later consumption. Diet varies with seasonal abundance of food items; primarily free-living (not wood-boring) insects, acorns or other nuts, and fruit. The woodpecker feeds in the air, on tree trunks and branches, in bushes, and on ground. It uses snags, telephone poles, fence posts, and other locations with open view for perches and engages in hawking for insects. It prefers insects older than larval stage, principally ants, bees, wasps, beetles and grasshoppers. Vegetable food includes acorns and cultivated nuts such as almond, various species of cultivated and wild succulent fruit, including apples, cherries, and peaches, serviceberry, hawthorn, dogwood, elderberry, and sumac. Also corn, (but not other cultivated grains), and wild seeds. Additionally it harvests acorn; shells it, generally breaks mast into pieces, and stores pieces (or whole meat if unbroken) in a natural crack or cavity. Several woodpeckers may use the same tree for storage, but individuals protect their own cache. Diet varies by season; flying insects make up most of the Lewis's Woodpecker's spring and summer diet. In fall and winter they feed principally on acorns, other nuts, seeds, and fruits. Unlike most woodpeckers, Lewis's does not peck at wood for food and is seen more often on top of a fence post than clinging to it vertically. As with the Acorn Woodpecker, its main method of getting food is catching flying insects; both species also store acorns and other nuts for winter, and sometimes damage fruit orchards. Unlike other American woodpeckers, it enjoys sitting in the open as opposed to sitting in heavy tree cover. Lewis's Woodpeckers have a more steady, buoyant flight than most other woodpeckers, with slower wing-beats and longer glides. In flight they can often be mistaken for crows. Generally, this bird is quiet, especially in flight, and seldom drums except a bit during breeding season. It begins nesting in mid-spring, earliest in the southern and latest in the northern part of its range. Pairs appear to be monogamous and may re-form each year on the same territory, which the male defends with calls, like the rapid "churr." A weak roll followed by several taps, drumming is done only in courtship. A raised wing display flashes the male's pink underparts, to attract his mate and to warn intruders. Nesting is sometimes colonial. It excavates soft, dead tree trunks and large branches, usually pine or cottonwood, making holes often in as much as two feet deep between chest high and extreme heights. This woodpecker will accept nest boxes similar to those used for the Flicker, Pigmy Owl, Saw-Whet Owl, and Grackle. The nest is constructed mainly by the male, though both participate; it is lined with wood chips. The female will lay six to eight (more or less) eggs, which are plain white in coloration. Incubation is done by both sexes – the female sitting during the day and the male sitting at night – and lasts approximately 12 days, after which the young will hatch. Naked, blind, and unable to regulate their own temperature, the hatchlings require constant care. The young leave the nest 4 to 5 weeks after hatching. After another week or so of feeding, the family joins flocks of other woodpeckers until winter, when individuals and pairs maintain their own food supplies. One recent study indicates this species will usurp active cavity nests of Hairy Woodpecker and Western Bluebird. Old nest holes may be used as roosts during all seasons of year. Juveniles remain near nest site for at least ten days. They beg for and receive food from adults during this time. Young follow adults and give begging calls when adults approach with food. In some broods, adults separated after young fledged; each adult took part of brood. 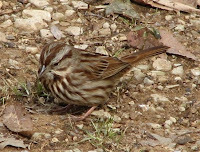 Plumage similar to adult plumage but duller; lacking silver on collar and upper breast, and with only traces of red on face, and feathers of hindneck can have white subterminal spots not present in adult. May have white spots on tips of outer secondaries and outer primaries. Considerable variation apparent in plumage coloration among juveniles in postbreeding flocks: some individuals are entirely dusky gray and black, others have limited red on facial region, pinkish red on breast, and silvery gray collar. The Lewis's Woodpecker seldom, if ever, excavates wood for boring insects. Instead, it gleans insects from the tree surface, or most commonly, flycatches. It spends long periods of time watching for flying insects from the top of a pole or dead tree, and then flies out to catch them in flight. This bird is quiet compared to other woodpeckers, with varied calls that are mainly soft. Sounds include a shrill ‘jeeer’ and chattering; with a squirrel-like series of ‘jee’ notes. Also: "chee-up", "ick-ick-ick" and a series of "churs". Listen to sounds of this species here. Special thanks to Bill Schmoker who, again, has lent woodpecker images, and to Randy Hancock...who I don't even know but who graciously allowed a friend to forward to me!. Unless noted as from Bill Schmoker or Randy Hancock, photos are from Wikipedia. 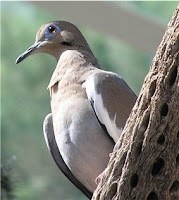 This bird is a couple inches smaller than the Eurasian Collared-dove, and has a large white patch in the wings that is obvious in flight and visible as a white line along the front of the wing, when perched. My pictures at least show that part. It's eyes, legs and feet are red. I'll include my bad photos here so you can see the smaller size (the dove is in the middle or upper left of this photo) compared to the Eurasian collared-dove (on the right) and it's short square tail, too. I wish you could see the eye, the skin that surrounds it is bright blue! I'll include a professional photo to show how lovely this bird has...I think that blue is just stunning! Can you imagine if the light was right and the eye itself showed red? Nice! This last photo is from Wikipedia. Wow, a dozen woodpecker species have been sighted in the county where I live here in way-south-central Colorado. I have seen only three in my back yard. I will have to do some research, but according to the Smithsonian, that’s how many might frequent Huerfano County…at least from time to time. A dozen! I’ve actually seen more than the three in my yard (Hairy, Downy and Northern Flicker); near here I’ve also seen Yellow-bellied Sapsuckers and Lewis’s Woodpeckers. I’d love to see an Acorn Woodpecker…they’re way-different looking; something you’d expect to see at a Mardi Gras! Since only four of this dozen have been observed in Denver County, but nine further north and about the same south of here…I figure info on the even dozen is needed here. I wonder just how much info is enough and how much is too much? Who wants to hear this stuff…that I write in order to learn, myself? This is a black-backed woodpecker which shows a conspicuous white rump and white wing patches, like a white crescent on each wing, in flight. Both sexes have light eyes on a black and white face with a red crown. It is common and readily seen in open oak woods and mixed woods with oaks. This is a noisy and gregarious bird, with a complex social system, and which keeps communal acorn caches called granaries. The adult has a black head, back, wings and tail, white forehead, throat, belly and rump. The eyes' irises are white on the black face. The adult male has a red cap starting at the forehead, whereas females have a black area between the forehead and the red cap. The white neck, throat and forehead patches are distinctive identifiers. There is often a variable, but usually small, amount of yellow (sometimes with one or more red-tipped feathers) on the throat. The Acorn Woodpecker is a common inhabitant of foothill and lower woodlands from along the American westcoast and the Southwest, through western Mexico and the highlands of Central America to the northern Andes. This species is closely associated with oaks and acorns and is most commonly found in pine-oak woodlands. 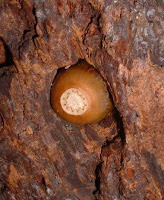 It is probably best known for its highly social habits and unique method of storing acorns in specialized trees known as granaries, although group living and acorn storage are not characteristic of all populations. This is one of the sedentary woodpeckers, but at least one population migrates annually and irregular migrations occur elsewhere when local acorn crops fail. In the U.S., Melanerpine woodpeckers are also represented by the Red-headed Woodpecker, Lewis’ Woodpecker, and possibly also the sapsuckers. Most species in this group are found in Central and South America, too. These woodpeckers use a wide variety of foraging methods, including nut storage, eating fruit, flycatching, and sapsucking, but rarely, if ever, drill for subsurface insects in wood in typical woodpecker fashion. Many in this species exhibit cooperative breeding and other complex social behaviors. Like at least one-third of the species in the genus Melanerpes, the Acorn Woodpecker is a cooperative breeder and lives in family groups of up to a dozen or more individuals. Birds in these social units store acorns communally and cooperatively raise young. Although acorns constitute a major portion of the diet, particularly during the winter, this species also engages in a wide variety of other foraging techniques including sapsucking, flycatching, bark-gleaning, and seed-eating. All members of the group spend hours and hours storing thousands of acorns in carefully tended holes in trees, telephone poles, and artificial places if natural places are unavailable. The Acorn Woodpecker is a medium-sized, clown-faced, black and white woodpecker with distinctive red crown, glossy black and white head, white eyes, and white rump and wing patches. As mentioned, there is sometimes a bit of creamy-yellow on the throat. Adult males have solid red crowns (with the exception of the isolated Colombian race); adult females have a wide black band separating the red crown from the white forehead. Males and females are about the same size. Juveniles, prior to the first Prebasic molt, are similar to adult males, with duller colors and lacking the gloss of adults. Younger birds also exhibit dark irises. The plumage of this bird is unmistakable and unlikely to be confused with any other species. The Acorn Woodpecker adapts well to suburban conditions, so declines in distribution due to human activities are primarily due to habitat degradation and the elimination of snags (standing dead trees), especially those used for acorn storage. A good colonizer, this woodpecker is regularly found outside its normal range sometimes far from breeding habitat. Most populations are resident, in other words most don’t migrate. In areas where there are large seasonal fluctuations in insects and other foods, year-round residency is dependent on the birds’ ability to store sufficient acorn mast (nut meats) to provide food throughout the winter. Family groups that exhaust their stores often abandon their territories and wander off in search of alternative food. Depending on the magnitude and extent of the crop failure, birds that abandon their territories may find space and acorns close by or be forced to leave the immediate vicinity but remain close enough to return the following spring. Widespread nut-crop failure can lead to permanent disappearance of a large proportion of the population and may lead to a “flight year” in which birds are found in habitats that are normally unsuitable for these birds, including deserts and open grasslands. The Acorn Woodpecker will use human-made structures to store acorns, drilling holes in fence posts, utility poles, buildings, and even using automobile radiators. Occasionally the woodpecker will put acorns into places where it cannot get them out; a few once put 485 pounds of acorns into a wooden water tank in Arizona! In parts of its range, the Acorn Woodpecker does not construct a granary tree, but instead stores acorns in natural holes and cracks in bark. If the stores are eaten, the woodpecker will move to another area, going from Arizona to Mexico to spend the winter, if necessary. Sapsucking is a communal affair, with group members congregating at sets of holes that are often used for several years. These sap holes are smaller in diameter and shallower than acorn-storage holes, but are spaced similarly. Their sap holes are readily distinguished from those made by sapsuckers, which are smaller, more closely and linearly spaced, and often girdle the limb. Insects are preferred food and are eaten at any time of year when weather permits. As mentioned, nuts are supplemental, stored extensively in the fall but then used primarily when conditions render insects unavailable. The increase in the proportion of acorns fed to nestlings with age is probably due to a combination of the greater nutritional demands of larger nestlings and the increasing ability of nestlings to handle larger nut bits as they grow. Almost any dead or living tree with deep, dry bark may be used as a granary; even parts of trees such as pine cones. Once a group has filled its granary facilities, it may also fill larger cavities such as old nest and roost holes with acorns. These birds store primarily acorns, but almonds, walnuts, hazelnuts, pecans, and piñon pine nuts are also stored when available. The storage trees are usually mature or dead pines or Douglas firs with thick, soft bark, but dead oak branches and fence posts are also used. The holes made by a colony are used year after year. The Acorn woodpecker prefers to use pine trees for granaries and for nest cavities, as its wood is quite a bit softer than Oak. Do not be too worried about the survival of your oaks and pines; the Acorn Woodpecker usually only pokes holes through the bark, which wouldn’t harm the tree. In addition, they prefer trees that are already dead. The woodpeckers collect acorns and find a hole that is just the right size for the acorn. I find it facinating that, as acorns dry out, they are moved to smaller holes; granary maintenance requires a significant amount of the bird's time. Acorns are such an important resource to the California populations, that these birds may nest in the fall to take advantage of the fall acorn crop, a rare behavior in birds. The species is highly social and usually lives year-round in social units, invariably roosting together in tree cavities. Nighttime temperatures inside roost cavities average significantly higher than outside ambient temperatures and are further augmented depending on the number of birds sharing the cavity. Heat loss is appreciably lessened by roosting communally in cavities, particularly in the presence of wind. Like other woodpeckers, these hop readily up limbs and around trunks of trees, using their tail as a prop; walking does not occur. As with most woodpeckers, flight is usually undulating, with dips and rises as it flies. However, this trait is not as pronounced as in many other woodpeckers and may even be absent, at least in some areas. Members of groups communally mob ground squirrels, crows and other relatively large species that come to their granaries and/or attempt to steal stored acorns. Mobbing consists of repeated aerial dives at the offending individual, combined with repeated Karrit-cut displays. It appears to be moderately successful in hastening the intruder’s departure. Acorn Woodpeckers similarly hassle avian predators such as Great Horned Owls, although communal mobbing of such predators has not been reported. Nests are only rarely defended against human intruders. However, groups will attack snakes that approach or attempt to enter nest or roost cavities. The Cooper’s hawk regularly attacks and captures Acorn Woodpeckers and is probably their most significant predator in North America. Other accipiters, falcons, buteos and owls may also capture them. Although direct evidence is lacking, bobcats and gray foxes are attracted to Acorn Woodpecker distress screams, suggesting that these mammals are also at least occasional predators. Because of this species’ abundance, Native Americans in California, and perhaps elsewhere, utilized Acorn Woodpeckers for food and even developed specialized traps to catch birds as they emerged from their roost holes. Feathers were used for ornamentation on garments: one existing full-size cape is completely covered with red crown feathers from what may have been several thousand individual birds. More recently, the primary threats to this species are from habitat loss and degradation. 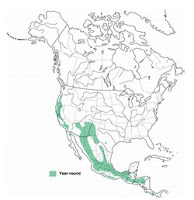 In the southwestern U.S. and parts of Mexico, much of the montane, riparian and pine-oak habitat where this woodpecker occurs has been damaged by overgrazing, which has probably lead to substantial population declines in many areas. Additionally, the poor regeneration of oaks in California, which is experiencing results of a disease called "sudden oak death" contributes to habitat loss. Conservation of this species will depend on the maintenance of functional ecosystems that provide the full range of resources upon which the species depends. These include mature forests with oaks capable of producing large mast crops and places for the woodpeckers to nest, roost, and store mast. Abundant throughout their range, Acorn Woodpecker populations are limited by the availability of acorns and granary sites. Their populations tend to be highly fragmented; as stated, their most significant current threat is habitat degradation. Management practices that preserve the normal age structure of the forest, with an emphasis on the snags and dead limbs used for granaries and nesting, are particularly important. Until recently, many of these trees and snags were removed because they were viewed as hazards or because they might attract lightening strikes. Fortunately, like many woodpeckers, the Acorn Woodpecker, adapt well to the presence of humans, if not persecuted, and readily use human-made structures such as utility poles and buildings for roost and storage locations. These birds will even feed on and store dog food, if it is available. The Acorn woodpecker does not migrate, however, it will move upslope in the fall. Acorn Woodpeckers generally do not migrate since they have a site-specific food storage system that they enlarge and defend year after year. However populations may wander if local acorn crops fail. A group of adults may participate in nesting activities; field studies have shown that breeding groups range from monogamous pairs to breeding collectives of seven males and three females, plus up to 10 nonbreeding helpers. Young Acorn Woodpeckers have been found with multiple paternity. Mating behavior is highly variable, ranging from predominant monogamy in some populations in Arizona and primarily cooperative polygyny in New Mexico to cooperative polygynandry in California. In general, Acorn Woodpecker groups contain one to as many as seven or more male breeders that compete for matings with one to three egg-laying females. In groups with more than one breeding female, the female co-breeders nest jointly and lay their eggs in the same nest cavity. Groups may also contain up to ten male and female nonbreeding helpers, usually offspring of the group produced in prior. Acorn Woodpeckers breed where there are and pine-oak woodlands; also along riparian corridors and river banks, and in Douglas-fir, redwood, and tropical hardwood forests as long as oaks are present or available nearby. It is found at sea level in southern California, but more generally in mountains up to the distributional limit of oaks (treeline). It is also common in urban parks and suburban areas whenever oaks are present and trees or other natural or human-made structures are available for acorn storage. Courtship displays and pair-bonding as traditionally defined are absent. In nonmigratory populations, however, breeding males and females usually remain together on the same territory throughout their lives, and close attendance of breeder females during their fertile period by breeder males occurs regularly in the groups. Acorn Woodpeckers are unusual in that they produce “runt” eggs in frequencies significantly higher than any other known species. Runt eggs are markedly small eggs, usually do not contain a yolk or are otherwise abnormal internally, and do not hatch. Overall, about four percent of eggs are runts and about twenty percent of clutches contain a runt. Runts are particularly closely associated with nests produced by joint-nesting females, where they are laid as the first egg of a clutch about half the time and overall constitute somewhat more than ten percent of all eggs laid. Perhaps this is why the egg distruction seems to be a positive rather than a negative behavior. Nest holes may be used repeatedly for many years; switches occur more frequently after a failed nesting attempt has occured. As with most woodpeckers, both sexes acquire brood patches and both male and female breeders incubate; nonbreeding helpers incubate only occasionally. Incubation period is eleven days. Onset of incubation is gradual, with the proportion of time spent in the nest increasing over the period of egg-laying. Full incubation is usually reached on the day the penultimate egg is laid. In nests where two females lay, incubation is usually initiated on the second day of laying. Hatchlings are blind, naked, and highly altricial. Although they lie prone for several hours after hatching, hatchlings soon balance upright, making extensive use of the large heel pads with which they hatch. Hatchlings beg with Tse and Rasp calls while waving their heads back and forth with open mouths. They close their mouths on and attempt to swallow anything they touch, including each other’s heads! Such interactions appear to be accidental; competition is best described as scramble rather than interference, at least during the first week when most brood reduction takes place. All group members normally help feed chicks beginning with the hatching of the first chick in the nest. Feeding rates are highest for breeder females, followed by breeder males and nonbreeding helpers. Fledglings continue to be fed by adults for several months, with the termination of most parental care roughly coinciding with the Prebasic I molt; three to four months after fledging. Adults enter the cavity to feed the chicks until the latter are three to four weeks old, after which the chicks usually climb up to the nest entrance to be fed. Nestlings are fed mostly insects, with the estimated proportion of the diet consisting of acorns increasing as the chicks age. Acorns are broken up into small pieces when fed to chicks. Insects, which are captured primarily by flycatching and to a lesser extent by bark-gleaning, are fed singly or in a chewed mass. Some adult birds divide up a fledged brood, each taking a few juviniles, but with this breed brood division is not apparent. All group members continue to feed remaining nestlings as well as free-flying juveniles after the first chicks have fledged. When second nests occur, juveniles from the first nest sometimes help provision nestlings, but also enter the nest and intercept food intended for the nestlings. WhatBird says a group of Acorn Woodpeckers are collectively known as a "bushel" of woodpeckers. Formicivorus means 'ant eater'...but these woodies enjoy eating many different insects. Listen to songs of this species: click here. You’ve all witnessed my wailing about the blasted squirrels that raise havoc with my bird feeders. Well, France and England are dealing with their pests, too. Suddenly, I feel blessed I have squirrels, and only squirrels, as my pest. In Europe, there are apparently too many pigs (perhaps I should say feral porkers). 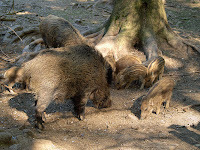 They are moving from the forests and into yards and gardens where they are becoming more and more at ease with people. In one town, a 200 pound (!) porker made it into a clothing store where it went on a rampage, sending customers running. After shoppers and staff had been evacuated, police moved in to deal with the intruder. But when beast charged, the officers were forced to open fire, leaving the run-away boar riddled with bullets. On NPR the other day I listened to a story of homeowners complaining of the porkers lounging around their yards just steps from their back doors! I would assume this can be most disconcerting, as the beasts are wild relitives of long ago domestic pigs. Today the wild pig will dig a wallow, or hole, in order to fill it with urine, as a part of the courting process. Eww! In addition, big males can be waist high, five feet long and weigh upwards of 300 pounds…not a creature you’d want to interupt while bathing for a date in your backyard. Elsewhere, train passengers in Brussels were delayed for almost four hours after their TGV train smashed into one of the animals that had strayed onto the tracks. The wild boar is a national icon, immortalised on crests of the aristocracy, it’s a favourite dish of Europe, and has been the target of tens of thousands of hunters in the hills and forests there for more than a thousand years. 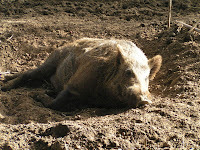 But now French boars have a problem: there are too many of them. Experts say the population of wild boars is for the first time above a million - despite a record 500,000 killed by hunters last year. 'It's an invasion,' said Morel Marleux, of the French Small Game Association. 'We need a war on boars.' Hmmmmmm...a Boar War? The population surge has led to an estimated 20,000 car accidents a year involving the animals and hundreds of millions of pounds of damage to crops and property as boars leave their traditional habitat of woods and forests to head into fields, gardens and backyards. “At first they went just in search of worms or larvae, but now they are increasingly partial to wheat, barley, potatoes and, above all, sweetcorn,” reported one worker. The boars are even heading further afield. The arrival of one on the Mediterranean island of Port-Cros, off Provence, made national news. Efforts are being made to catch it as it eats it way through huge quantities of rare plants. It has been said there are up to 1,000 wild boar and feral pigs living in the British countryside and that the number could easily rise to 10,000 within 20 years if there is no action (contrasted with an estimated million-plus living in France right now). Boar only returned to the wilderness fairly recently. 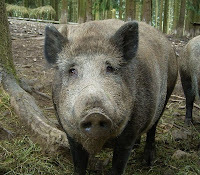 After some 300 years of absence, boar started escaping from wildlife parks in the 1970s. Yet more escapees found their way into the woods around Wales, Scotland and England, during the 1990s. This fairly secretive creature can be aggressive if approached especially if a sow is nursing her young. The main problem facing this creature is that it's rather tasty. Since Britain started farming more boar, it's not uncommon to find the beast on restaurant menus or on supermarket shelves or - in the case of one Gloucestershire town - to find a wild boar strolling down the aisles at the Co-op. There are fears there'll be a glut of boar meat and the Food Standards Agency is preparing advice on how to handle the meat and how to prepare it. Okay, this might be too much information, but after watching all the porkers run through the woods, can you imagine what your yard would look like with just a few of these leavings? Yeah, I'm suddenly happy with a few squirrels! To finish this marvelous tale, click the story title or here. You're in for quite a treat! This is the first time this year I've seen them this year. 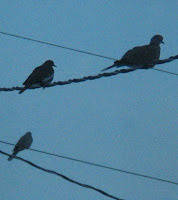 So far, it appears 'only' to be the Gray-crowned variety; last year I had all three versions. Oh my...I just love these birds. It's nearly noon, 25 degrees outside, at least 18" of new snow on the ground and...it's still snowing. Gawd I love this time of year! That’s how I see it, too. From there, woodpeckers developed specialization in the softwoods of conifers; and some which prefer Ponderosa pine with heartwood disease; some that prefer hardwoods, especially aspen; and others that prefer the desert life…saguaros; and many species prefer other diseased and dying trees. It’s a beautiful design. Woodpeckers are well-adapted for a life on tree trunks and limbs, with stiff tail feathers which act as a brace for moving along vertical tree trunks. Their feet are also adapted for climbing and hanging. All woodpeckers have two toes pointing forward and either one or two toes pointing to the side or slightly backward, so woodpeckers are able to grip the surface of a tree with opposable toes. Woodpeckers have evolved chisel-like bills coupled with strong neck and head muscles. These adaptations give them the ability to chip away bark and chop at wood to uncover insects and their eggs and grubs for food, as well as to create nesting cavities deep within a tree. The extremely long (up to four inches in some species) tongue, barbed with bristles, enables the bird to spear insects hidden deep in small holes. Many woodpeckers’ tongues are also sticky, which aids bringing up multiple insects deep within a crevasse. Unfortunately for them, these birds are closely linked to forest health; mixed-age stands of healthy trees that offer food and cover and old, dying and diseased trees that offer different food as well as nesting sites. This species will not survive simply by ‘leaving them alone’ because we no longer leave tries after logging and spray or remove diseased and dead trees. Snags are what many species live for. Because they are dependent on certain forest characteristics, including snags and trees with heart-rot for drumming, nesting, roosting, and feeding sites, woodpeckers are vulnerable to alterations of forest habitats. Short rotation logging or selective-cutting of trees with insect damage or heart-rot have caused population declines of some species of woodpeckers in many parts of the world. Intensive cutting of dead trees for firewood is also potentially harmful to woodpecker populations. The role of woodpeckers as forest insect predators should not be overlooked by those seeking to improve timber production. It’s my contention that we do more harm air-spraying forests with various poisons when the natural explosion of an insect is coupled with the natural explosion of bird health and population. I do not understand the constant manipulation of life for profit. Wood-boring and other insects which are inaccessible to other birds are consumed by woodpeckers. Studies in parts of North America have estimated very large numbers of insects consumed; one black-backed woodpecker may eat 13,500 beetle larvae annually. In some areas, woodpeckers are thought to be able to eat enough larvae to prevent outbreaks of insects that damage and kill trees. Since wood and saw logs are very valuable, woodpeckers could play an important economic role. Aesthetically, their value is incalculable. The sound of a drumming woodpecker is a sign of the approach of spring. The sight of a three-toed or black-backed woodpecker is eagerly sought by bird-watchers. After pairing, nest construction begins. 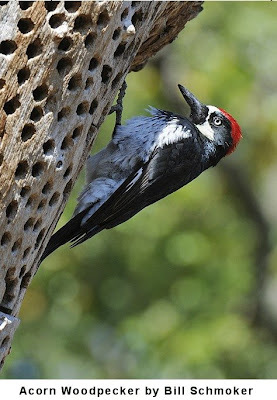 Woodpeckers do not bring in nest material; eggs are laid on the wood chips that dropped down during cavity construction. Both sexes play a large role in nesting; both construct the nest site and share the duties of incubation, which takes about two weeks. A nest will usually consist of 2-5 round white eggs. Since these birds are cavity nesters their eggs do not need to be camouflaged and the white color helps the parents to see them in dim light. The eggs are incubated for about 11-14 days before the chicks are hatched. Young are altricial, meaning they are blind and naked at hatching. Both sexes develop a brood-patch and sit on the nest. Generally they share daytime duties, but the male is the one who most often takes the night-shift. The adults are kept busy, one obtaining food while the other broods the young. Once the young have grown feathers and can maintain their own body heat, both adults bring in food just to the entrance of the nest, feeding the youngsters without entering. Adults regurgitate partially digested insects to feed the young. Later, whole insects may be brought to the growing chicks. Young leave the nest after 25-30 days and usually remain with the parents for only a few days before becoming full independent. The woodpeckers, piculets and wrynecks are a family, Picidae, of near-passerine birds. Members of this family are found worldwide, except for Australia and New Zealand, Madagascar, and the extreme polar regions. Most species live in forests or woodland habitats, although a few species are known to live in desert areas. They are also absent from the world's oceanic islands, although many insular species are found on continental islands. There are about 200 species and about 30 genera in this family; 20 are native to North America. Many species are threatened or endangered due to loss of habitat or habitat fragmentation and pesticides. Two species of woodpeckers, the Ivory-billed Woodpecker and the Imperial Woodpecker, have been considered extinct for about 30 years (there has been some controversy recently whether these species still exist). In woodpeckers, many species exhibit patches of red and yellow on their heads and bellies, and these bright areas are important in signalling. The dark areas of plumage are often iridescent. Although the sexes of Picidae species tend to look alike, many woodpecker species have more prominent red or yellow head markings in males than in females. Overall the woodpeckers are arboreal birds of wooded habitats. They reach their greatest diversity in tropical rainforests, but occur in almost all suitable habitats including woodlands, savannas, scrub lands, bamboo forests. Even grasslands and deserts have been colonized by various species. These habitats are more easily occupied where a small number of tree exist, or in the case of desert species the tall cactus are available for nesting in. A number of species are adapted to spending a portion of their time feeding on the ground, and a very small minority of species have abandoned trees entirely and nest in holes in the ground. Picidae species can either be sedentary or migratory. Many species are known to stay in the same area year around while others, such as the Yellow-bellied Sapsucker, travel great distances from their breeding grounds to their wintering ground. The woodpeckers range from highly antisocial solitary species which are aggressive to other members of their species to group living species such as the familial groups of Acorn Woodpeckers. Group living species tend to be communal group breeders. In addition to these species a number of species may join mixed-species feeding flocks with other insectivorous birds, although they tend to stay at the edges of these groups. Woodpeckers are diurnal, often roosting at night inside holes. In most species the roost will become the nest during the breeding season. The diet of these birds consists mainly of insects, such as ants and beetles, nuts, seeds, berries, some fruit and sap. Species may feed generally on all of these, or may specialize on one or two. All members of the family Picidae nest in cavities. Almost every species nests in tree cavities, although in deserts some species nest inside holes in cactus and a few species nest in holes dug into the earth. Woodpeckers and piculets will excavate their own nests, but wrynecks will not. The excavated nest is usually only lined from the wood chips produced as the hole was made. Many species of woodpeckers excavate one hole per breeding season, sometimes after multiple attempts. It takes around a month to finish the job. Abandoned holes are used by many other birds and mammals which are secondary cavity nesters…adding to the ecological importance of woodpeckers. Most woodpeckers live all year in the same area and don't migrate. Woodpeckers can be found in a variety of habitats including farmlands, open woodlands, orchards, oak and pine woods, parks and gardens. Woodpeckers are very beneficial to our environment. They eat thousands of wood boring insects and other garden pests. You can usually observe most woodpeckers spiraling around a tree trunk in search of food. Attracting woodpeckers to your own backyard is very enjoyable and these perky birds will reward you by eating insect pests in your garden such as crickets, ants, grasshoppers, flies, spiders, wasps, beetles, and grubs. A single flicker can eat thousands of carpenter ants in one day! Why would anyone want to attract those noisy, wood drumming, flying wonders to their backyard? After all, don’t they sometimes peck holes in house siding and drum on gutters? Perhaps, but woodpeckers are among the most colorful and interesting birds to watch. Their toes are designed differently from most other birds, enabling the bird to walk upside down on trees and perch where other birds cannot. Most species of woodpeckers eat insects as a large part of their diet, and usually people are willing to share their backyard insects with the birds. Some woodpecker species are becoming rare and need help to avoid extinction. Woodpeckers can be found just about anywhere there are trees. If you have large, old trees in your yard or live near a park or woodlot, you may have one or more species of woodpeckers in the neighborhood. To supplement existing vegetation and habitat; plant a few native fruit trees and fruiting bushes for the birds. If you have a small yard, look into the many available small trees; there are quite a few under 20’. Many woodpeckers enjoy eating berries as well as insects…like most birds. Planting nut-bearing trees, such as oak, pecan, and almond, will attract Lewis’s woodpecker and Acorn Woodpeckers, if those species are indigenous to your area. Lewis’s woodpecker is the only woodpecker in the United States with wings that are entirely solid in color; Acorn woodpeckers look like clown-faced birds. Woodpeckers eat insects, but will also eat acorns, nuts, fruit, sap, berries and pine seeds. Purchase or make your own suet cakes. Offering suet in your backyard is the best enticement to attract woodpeckers. Smear suet in the bark of a tree, offer suet cakes in wire cages or use other specially designed suet feeders that you can buy or make yourself (pine cones are great). Woodpeckers will come to your backyard feeder if you have plenty of perching space and offer their favorite food: black oil sunflower seed. The woodpeckers in my yard prefer the cylinder with holes large enough to pull the seeds through. 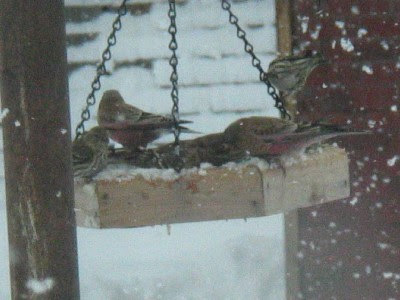 It is about 10-12” long and perhaps 3” in diameter; plenty large for the birds to hang on. Finches like it too. Some woodpeckers will be attracted to cracked corn or grapes, raisins (plumped in water) and apples on a platform feeder. Create or preserve a snag in your backyard. A snag can be an old dead tree or tree stump. Snags are extremely important for providing food, nest sites and homes for woodpeckers. Most woodpeckers prefer dead or rotting trees for excavating their nest holes. Mount woodpecker houses around your yard. Plant an oak tree or shrub. Woodpeckers love acorns, as do many other birds. Plant a pine tree or evergreen shrub. Woodpeckers, like other birds, will love the shelter they provide as well as eat the pine seeds and sap. This isn’t found to hurt the tree. Lots of woodpeckers relish the sugar water found in hummingbird feeders. I take the top off plastic hummingbird feeders and use an electric drill to enlarge some of the ports a bit to accommodate their beaks…for them, grosbeaks and tanagers, as well. Plant as many berry or fruit producing bushes or trees as you can. They come in a variety of sizes; choose dogwood, serviceberry, tupelo (aka: blackgum or sourgum), mountain ash, cherry, grapes, bayberry, holly, blueberries, apples, especially the tiniest of crabapples that all birds can swallow whole (less than ½ inch), mulberry, brambles like blackberries and raspberries, and elderberries. You’ll have a bird habitat in no time! If you are interested in the damage and control methods of woodpeckers, be sure to leave a note and I’ll include a piece on that too. There are many helpful ways to deter woodies from using your home as a granary or a sounding board! Just remember; lethal control is generally ineffective (and illegal without special permits), as new birds (or about any such targeted animal) will just move into the space vacated by the dead ones. There are ways to embrace the value of this bird, keep it from driving you crazy and keep your home intact. Just ask. Artwork from Wikipedia - I hope you enjoy all the paintings I found!